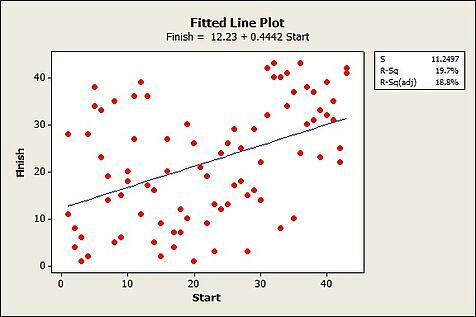 As promised in my last post, this time I’m interested in using Minitab and fitted line plots to analyze driver start and finish positions. 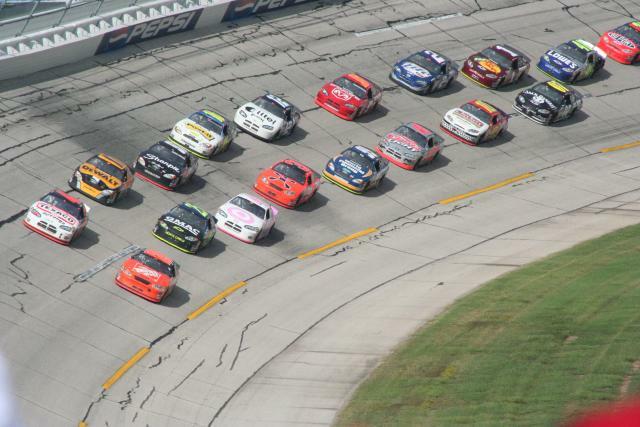 I’ve always assumed that drivers starting in a position close to the front tend to also finish in the top because they have better cars than drivers who qualified in the latter part of the 43-car starting grid. But then I remembered back to the results of the first race of the 2011 NASCAR Sprint Cup Season. NASCAR driver Trevor Bayne started 32nd and still was able to win this year’s Daytona 500. I found myself wondering—does driver qualifying position really have anything to do with where a driver will end up finishing a race? I collected driver-start and driver-finish statistics from 2 randomly chosen races from the 2011 season. (This information is freely available on NASCAR.com.) 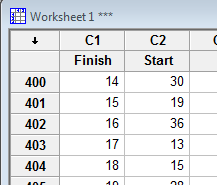 I included both finish and start positions for all 43 drivers participating in each randomly chosen race. As you can see from the graph, driver start and driver finish positions are all over the place! However, you can also see that the fitted regression line is trending upward—suggesting that as start position moves to later in the starting grid, finish position also worsens, on average. And the p-value of < 0.0005 tells us there is a statistically significant relationship because it is less than our significance level of 0.05. But with an R-sq value of 19.7%, this relationship is pretty weak. 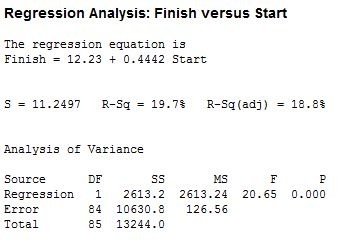 The R-sq value tells us that the place a driver starts in accounts for only 19.7% of the variation in finish position. The other 80.3% of the variation comes from other variables, such as the talent of the driver, the car they are driving, and the crew they work with. For all you fantasy NASCAR players out there, this information might keep you from picking drivers based on their past track starting positions alone. It’s exciting for a driver to start a race on the pole (1st), but it looks like while driver starting position might help some, it’s still anybody’s race to win. Thanks to Kevin for his help with this post!